JACKSONVILLE, Florida (WABC) -- Police in Florida say an 8-year-old boy is behind the accidental shooting death of his younger sister and injury of his brother. The grandmother of the two shooting victims was distraught as she learned about Saturday's tragic accident. "It's a bad situation just all the way around," grandmother Marie Peterson said. "The whole thing is horrible. The whole situation is horrible. I feel for everybody in it." 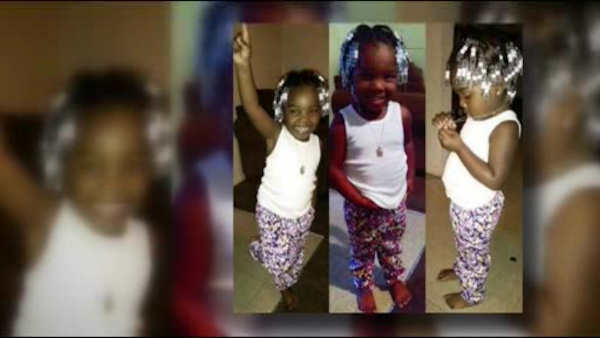 Relatives say 5-year-old Serenity Allen was killed and her 4-year-old brother injured when the bullet from a handgun struck them both. Police say the gun was fired by their brother. "I guess the best way to describe it would be a tragic, unfortunate, accidental shooting that we have here," Jacksonville Sheriff's Office Chief Chris Butler said. It happened in the early afternoon inside the Roosevelt Garden apartments, where police say the children had no adult supervision. Authorities said their mother may have been out to the store. Police also say it's unclear how accessible the handgun was, but they're asking the public to keep all guns locked up and out of reach from children. "For me, it comes down to responsible gun ownership," Butler said. "And securing your weapons within your home, making sure that they're locked up and children don't have access to them." Possible charges are pending, but the grandmother said the family needs prayers right now, not judgment. "People will sit around and they'll have their own perceptions of what they feel this one did or that one did, or how this should go or that should go," Peterson said. "But you can't say that until you're in that situation." The Division of Family and Children Services is involved with this case, but charges against the parents or any other parties are not yet known.